Pending written confirmation: we have provisional sanction from the American Brittany Club (ABC)! We are now rapidly working on being sanctioned by the American Kennel Club (AKC). Please email Todd your photos along with the captions you want and he will post them on these photo pages. Cost is $25 per dog. 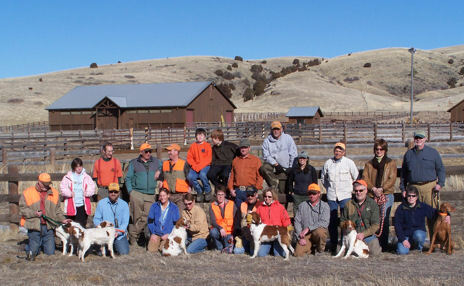 Some of the approximately 30+ folks who attended the Fun Trial at Grey Cliff Ranch on Feb. 7th, 2009. Also pictured are some of the 40+ wonderful Brittanys that were there (the whole "point" of the event!) and a Visula (hey, we like all hunting dogs!). The weather was perfect, the dogs worked well, the food was super, the cover was good, and a GREAT, relaxing time was had by all. This is an informal fun event for our club. Each member and his/her dog will be braced against one other handler and their dog. You will have 30 minutes to hunt for 5 Chukar that have been planted in a 40 acre bird field. The handler or his gunner will shoot the birds. Each dog will be scored by a judge that will walk along with the handler and dog during the brace. Your dog will receive points for finds, retrieves, and backs. Any help from members with judging, scoring, and bird planting is appreciated. This format is designed to be fun, informal, and stress free. We plan to start at 8:30 AM and finish before dark. Tana Kradofler is running the event and will work with folks from out of the area to make a brace time convenient for them. We will have lunch available for $5.00 and access to a heated shop with rest rooms. Tana needs people who plan on attending this event to RVSP to her by January 25, 2009. Please call Tana at 406-388-4974. From Bozeman take I 90 to Belgrade and turn south onto Jackrabbit Lane, Highway 85. Continue south on this road until you reach Four Corners and take a right, (West) onto Highway 84. Follow Highway 84 until you see the Madison River, (Blacks Ford), and turn right, (North) on Madison River Road. After 4 ½ miles take a right onto Buffalo Jump Road. It is then about one mile to the ranch entrance where they have a large GCR sign over the entrance. If you are coming from the West or Three Forks, MT you exit I 90 at the Logan, MT exit and head south on Buffalo Jump Road, you will have 15 to 17 miles of gravel road and you will see the large GRC sign over the entrance. In case you get lost the ranch phone number is 406-285-6512. Please try the ranch web site from time to time, (its currently being updated), I am told they have a very nice map and directions when their site is up and running.